I.S. Johar’s celebrated 1965 comedy with Mehmood delivered a message on secularism that has been followed by Bollywood ever since. Karnataka’s Tipu Sultan celebrations created quite the political stir this week with the BJP calling him a ‘Muslim tyrant’ and the state Congress calling him a ‘freedom fighter’. But there was a time when even Bollywood placed Tipu Sultan on the pedestal with other important historical figures such as Gandhi, Nehru and Bhagat Singh — I.S. Johar’s 1965 comedy, Johar-Mehmood in Goa mentions the 18th-century ruler in the immortal song “Na Koi Raha He Na Koi Rahega”. 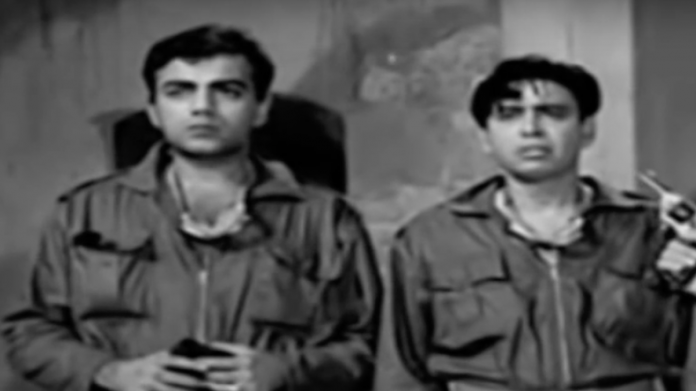 Johar-Mehmood in Goa uses the classic Bollywood ‘lost and found’ trope that involved two brothers separated at birth— Ram (played by director I.S. Johar himself) and Rahim (comedian Mehmood). Set in Goa, both brothers are on a quest to find love and plot ‘anti-state’ activities against the Portuguese government in Goa. In the beginning, we are told the story of Mary, a young girl in love with Peter. The two are about to get married when Peter gets a call to join his regiment. After he leaves, she discovers she is pregnant with twins. Unable to fend for them herself, she leaves them at the doorstep of two different households hoping for the best. Years later, we see the two boys grow up as Ram and Rahim, adopted sons of the town’s Pandit and Maulvi. This takes place at a time when India was independent but Goa was still under the hold of the Portuguese. Though young, Ram and Rahim are already freedom fighters. They shout out “Portuguese sarkar murdabad” in public. While being chased by the police, they unknowingly come across their birth mother who is now the Church’s Mother Superior. As Mary’s maternal instincts kick in, she shields them from the police but the duo gets captured later. In the police station, it is revealed that their own father, suspected to have died, survived and is now the police superintendent. Another 12 years later we see that Ram and Rahim have become revolutionaries and have formed the Inquilab Party. They go around the city creating havoc for the Portuguese government through bank robberies, attacks on the police and even abduction of the Portuguese governor’s daughter Rita (Soniya Sahni). Alone with Rita in a forest following the kidnapping, Ram sings about the great revolutionaries of the country in Na Koi Raha Hai Na Koi Rahega, placing Tipu Sultan with the likes of Mahatma Gandhi, Nehru, Rani of Jhansi and others. The song, sung by Mukesh and Usha Khanna, goes on to say that India will always be independent. We also see Simmi (played by Simi Garewal) coming forward to join Inquilab Party after having lost her family at the hands of the Portuguese government. She brings to the party her impressive knife throwing skill, which will be put to use in their plans to execute the governor. The revolutionaries come dressed as dancers and we get a chance to see Ram and Rahim dressed as female dancers do a thumri dance in Mar Gayi Allah. The movie takes turns being funny, sad, comic and romantic. Towards the end, when the Portuguese government comes close to stifling the movement, we see Rahim escape from the police outside by making four others undergo plastic surgery inside a mosque to create his look-alikes. The ultimate weapon, however, used by both Ram and Rahim to escape capture seems to be secularism! Both hide in a place of worship, and despite their religious differences is united by a cause. By this time, Rita has been ‘cured’ of her Portuguese lineage and is now a saree-clad Bharatiya nari, while Simmi falls head over heels for Rahim. Johar-Mehmood in Goa is a quirky take on secularism that came 12 years before Manmohan Desai’s famed Amar Akbar Anthony (1977). It used the plot of estranged brothers that has been used several times by the film industry— from Johny Mera Naam (1970) to Yaadon Ki Baaraat (1973) to Karan Arjun (1995) and others. I.S. Johar was Bollywood’s glorious actor-turned-director who often dealt with the subjects of secularism and patriotism. 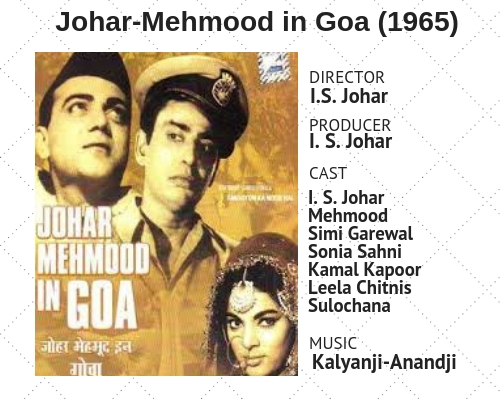 Johar-Mehmood in Goa even saw its sequel in Johar-Mehmood in Hong Kong (1971). The duo seemed to be inspired by the Bob Hope-Bing Crosby style comedy. With an illustrious career in Indian and abroad, Johar’s comic filter to anti-establishment films connected with the audience, instantly making his films a laugh riot.